Epiphone vintage guitars general info and collecting. Private vintage guitar collector. Pictures, history for epiphone vintage guitars. Epiphone was a family business established in 1873 as "the House of Stathopoulo" by Anastasios Stathopoulo, a greek violin maker. In 1923 they incorporated and at this time made mostly high quality and fancy banjos. In 1928 the name was changed to "Epiphone" after Epi Stathopoulo, president of the company and one of the founder's sons. In the 1930's, the company changed its emphasis to guitars. Epiphone was the only banjo company to successfully switch to guitar production. In 1952/1953 the C.G. Conn Company's (a band instrument manufacturer) Orphie got Epiphone distribution rights moved. Now most guitar production went to Philidelphia (although the labels still said New York). This was done partially as a "strike break" move, as New York Epiphone workers were in conflict with the Stathopoulio family. The Stathopoulo family regained control again in 1955, but few if any instruments were made in 1956 and 1957. 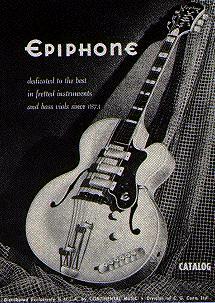 The Chicago Musical Instrument company (CMI), which owned Gibson, bought Epiphone in 1957. When CMI purchased Epiphone, they got all of Epiphone's current stock of parts including bodies, necks, pickups, etc. 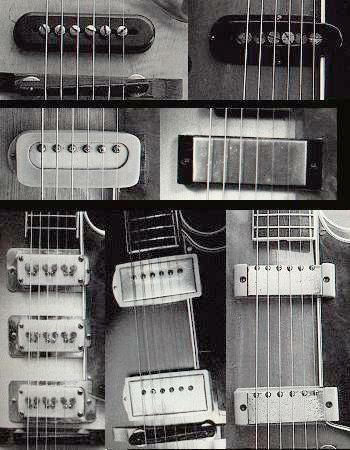 Gibson used these "New Yorker" parts in conjuction with their own parts when making Epiphones from 1958 to 1961. By 1961 Gibson has used up all the original New York-made Epiphone parts, and then used Gibson parts made in Kalamazoo. Instruments from 1958 to 1969 are commonly referred to as "Gibson/Epiphones". When Norlin purchased CMI (Gibson) in 1969, all Epiphone production was moved to Japan. Later, productions was moved to Korea. Many of the imported instruments bear a label with Gibson's Kalamazoo address and no mention of Japan or Korea, which can be misleading. However, these import instruments have model numbers that do not correspond with Kalamazoo made Epiphone model numbers listed below. Also the serial number is usually 7 digits or longer (unlike U.S. made Epi's with a 6 digit or less serial number). High-end acoustic archtop Epiphones are constructed of high quality, solid woods. Electric archtop Epiphones are made from laminated woods. Because of this, electric archtop Epiphones are much less desirable, and are worth considerably less than fully acoustic archtop models. 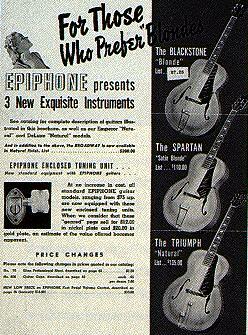 Pre-1937 Epiphones are of very high quality and are generally much scarcer than later models. They have a smaller body and less modern neck feel than later models, and are less collectable. The most collectable models are those made from 1937 when body sizes were increased, up to the end of New York productions (1956). Most desirable are the professional grade models on which the company built its reputation: Emperor, DeLuxe, Broadway and Triumph. These models, along with Gibsons, are considered by most to be the best vintage factory-made archtop guitars produced. Mid-range and low-end models are generally regarded as student model instruments. New York-made electric archtops are interesting but generally are not as collectable as equivalent acoustic models. Acoustic models are solid carved top and back whereas electrics are plywood. In addition, the electronics on New York Epiphones are not as sonically good as compared to Gibson of the same period or to the later Gibson-made Epiphones. Therefore, New York electric archtop Epiphones are worth considerably less than Gibsons of the same period. 1940 Epiphone ad: "For those who prefer blonds"
Early Gibson Epiphones with New York pickups are of interest to collectors. Most hollowbody Epiphone electrics bring less than the equivalent Gibson models. Double cutaway thinbody electrics are the most highly sought after electric archtop models. The Emperor (single cutaway) is the rarest of the thinlines (66 made). The Sheraton, especially the early version with blond finish, is also very collectable. Sheratons with New York pickups are worth the most, but not for sound. The Riviera, though equal in playability and sound, is not nearly as collectable. The Casino is collectable only because John Lennon played one. It may seem like a contridiction in terms: New York pickups are sonically inferior to Gibson pickups, but models fitted with New York pickups from 1958 to 1960 are worth more than post-1960 models fitted with better Gibson pickups. These Epiphone models made from 1958 to 1960 like the Sheraton and Coronet are much more collectable (and valuable) with New York pickups, even though everyone agrees the later models sound much better fitted with Gibson pickups. Solidbody electric Epiphones with New York pickups are interesting to collectors, but not for their sound. Later solidbody models with mini- humbucking pickups bring less money than Gibson equivalents with standard humbucking pickups. None are especially valuable, although Epiphone workmanship and playability is equivalent to Gibson of the same period. Model numbers date from Epiphone's ownership by Conn in 1953 until Gibson moved Epiphone production to Japan in 1970.
Letters preceding model number: E=electric archtop, A=acoustic archtop, FT=flattop, SB=solidbody, EB=electric bass or banjo, EC=classical, EM=mandolin, BV=bass violin. Letters after model number: D=double cutaway, N=natural finish, T=thinbody, V=vibrato, MV=maestro vibrola, C=cherry or cutaway, E=electric. * In 1961, Gibson began using only the even-number model designation for sunburst, blond or any other finish. Note: not interested in these model. Information here for completeness. Model number listed on a blue label with a Kalamazoo address, but usually say "Made in Japan" at the bottom edge of the label. Left: Epiphone label as used from 1935 to 1956; this one is 1956. "Epiphone Banjo Corporations, Long Island City, NY": 1928-1935. "Masterbilt" in fancy lettering: 1931-1937. Silver oval label, "The Epiphone Corp" on banner, "New York" and "Builders of Art Musical Instruments" below banner: 1932-1933. Rectangular label, white paper with blue or blue-green border and "Epiphone, Inc, New York, NY, USA": 1935-1956. Gibson made, rectangular label, blue paper, slashed C logo and "Epiphone Inc, Kalamazoo, Michigan": 1958-1970. Pic thanks to LB Fred. Row 2: 1948 Tone Spectrum Zephyr Deluxe pickup, 1950 non-adjustable NewYork Century pickup. Row 3: 1950's Adjustable DeArmond pickups, 1949 Tone Spectrum pickups, 1949-1961 "NewYork" pickups. Note: "New York" style pickups (right side column 3 above, and color picture below) are the most common New York-era Epiphone pickup. They are also considered the "best" top-of-the-line pickup model for pre-1962 Epiphones. New York: retangular metal covered with small slot-screw poles, poles very close to edge, mounted to top by screws through cream-colored "blocks" or side extensions, dimensions 1 1/8" by 2 13/16" (3 5/8" wide including mounting blocks): 1946-1961. Rectangular metal covered, larger than New York style, 1 1/2" by 3 1/8", phillips-head screw poles, poles not in center but not as close to edge as New York style, yellow/cream colored frames: 1950-1954. Gibson made Mini-Humbucking: used on Gibson modela like the 1969 Les Paul Deluxe, samller than Gibson standard humbucking pickup, 1 1/8" by 2 5/8", double coil, rectangular metal covered, slot head screw poles close to edge, black plastic frame, similar in size to the New York style pickup: 1961 to 1969. Gibson made P-90 pickup: standard on many Gibson models of the period, single coil, poles across center, attached by screws through triangular "ears" extending from each end, some models fitted with rectangular (no ears) "soapbar" P-90 pickup covers. Frequensator: allows for a longer string length on the 3 bass strings, shorter string length on the 3 treble strings, sometimes reversed by players to accommodate short strings, high end models: 1939-1970. Vibrato: flat-arm, strings wrap around metal cylinder of graduated diameter, wooden plate with E logo: 1961-1970. Truss rod adjustment at body end of neck: 1939-1951. Truss rod adjustment at peghead: 1951 and later. Epiphone used their own tuners with a slashed "C" logo and a pearloid button from about 1947 to 1961 on most mid to high-end models. On their low-end guitars, they used an assortment of different tuners. Script: most Epiphones of the pre-Gibson period have a script logo with a standard script "E". A few early models have block letter logos. Gibson continued using New York-made Epiphone necks, with laminated construction and script "E" logo, until all New York necks were used. Slashed "C": Epiphone's stylized "E", which looks like a "C" with a horizontal slash, appeared in 1939 in literature and on metal peghead plates. Models with inlaid or paint logos made the changeover to Gibson necks and the slashed "C" logo style circa 1961. 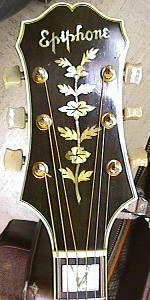 On flat tops, the Gibson neck can be distinguished by a wider flare towards the top of the peghead. By the 1963 catalog, all solidbody guitars are pictured with the slashed "C" logo. Peghead "ferns". These varied considerably from guitar to guitar, year to year. Left: peghead style on most Deluxe models. 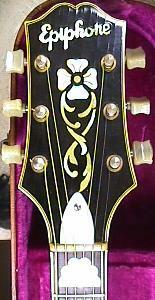 Note the standard script "E" and cloud style fingerboard inlay. On some Deluxe model, Epiphone used Emperior style fingerboard inlays instead. Middle: peghead style on most high-end models like the Emperior. 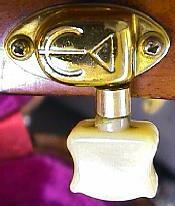 Note the standard script "E" and "V" fingerboard inlay; it's pearl with a "V" insert of abalone. 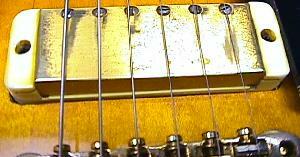 Right: close-up of the "V" inlay used after WW2 on Emperor models and certain Deluxe models. Before the war, the "V" inlays were all pearl (no abalone), and had a black separating line to separate the "V" from the block. After Gibson bought Epiphone in 1957, Epiphone parts were used up before Gibson parts were issued. This occured on Gibson-made Epiphone starting in 1958. In addition to New York pickups, both acoustics and electrics featured New York necks with a pronouced "V" shape that Gibson necks did not have. The New York Epiphone peghead shape is also different from that of the later Gibson made necks. The stock of Epi-made necks ran out in late 1961 or early 1962 on most models. pulling away from the body on NY era Epi's. Binding: The binding used on NY era Epiphones (1958 and before) was troublesome. The binding was made of celluloid, and glued in place with an Acetone based glue. The problem is that the binding shrinks considerably with age, and can literial turn to dust. There is no way to fix this short of replacing the binding. Environmental issue (UV light and temperature extremes) can make the problem worse. Epiphone "carrosel" knob from the 1950's. until about 1960. The brass "ten position"
Knobs: Epiphone most typical electric guitar knob of the 1950's was the "carrosel" knob. This bakelite material knob was very unique to epiphone. When Gibson owned Epiphone (after 1957), they often marked inferior quality guitars as "seconds", and sold them at a discount to dealers or employees. These markings were stamped into the wood on the back of the peghead. A "2" stamp is sometimes seen, designating a "second", which had some cosmetic flaw. If there is a serial number on the back of the peghead, the "2" is usually seen centered above or below it. Another type of Gibson/Epiphone reject stamp is the "BGN" stamp, designating that instrument as a "bargin" guitar. These were only sold to employees at substantial discounts. This stamp is also seen on the back of the peghead. Sometimes the "BGN" is stamped vertically with the "N" below the "G" which is below the "B". BGN instruments weren't acceptable to Gibson/Epiphone as sellable to the public. All second instruments are usually worth less than the same guitar that is not a second (given condition as the same). BGN instruments are worth less than a second instrument because these tend to have some fairly serious cosmetic flaw. Epiphone Serial Numbers (How to Find the Year). The easiest way to tell the year of an Epiphone instrument is by its serial number. Serial numbers are from Jim Fisch, L.B. Fred, Tom Wheeler, Walter Carter. There are no known factory ledgers for Epiphone. Therefore all serial numbers/years are approximations. Many serial numbers/years have been drawn from the sales records of Petty Music Company of Pittsburgh. Because this in the only known serial number/year sold list, it is the only real data available. Obviously it has some shortcomings as it is just the sales for one music store. For the most part serial numbers after 1932 are consecutive, and hence provide production numbers indicating the number of instruments produced. Jim Fisch, L.B. Fred have established an Epiphone serial number registry. This has helped in the dating of old Epiphones, and has given a lot of information regarding production numbers. Obviously any production number conclusions drawn are based on the instruments Jim has recorded only. Serial Numbers, 1932 to 1944, acoustic guitars only. For 1932 and 1933, the serial number is die-stamped on the interior side of an instrument's back. You can see this by looking thru the bass-side "f" hole, generally below the applied label. From 1934 forward, the serial numbers were typed or stamped directly on the Epiphone label. The last documented serial number in this series is 20142. Serial Numbers, 1935 to 1944, electric instruments only. With the start of the Electar model line in late 1935, Epiphone began a new serial number system for their electric instruments only. These numbers are die-stamped and are between 3 and 5 digits in length. Usually they are located on the top rear of the peghead. Since these numbers were applied before the instrument was painted, the serial number only gives an approximate age (especially on less popular instruments such as electric banjos and electric mandolins). Serial Numbers, 1944 to 1950, acoustic guitars only. For some reason, a new numbering system was started in 1944. The starting point of serial number 50,000 was used. There were a couple of reasons for this: the death of Epi meant his widow's shares where purchased causing a financial restructuring of the company and it's assets. Also changes in production methods prompted a change in inventory and the numbering scheme. Serial Numbers, 1944 to 1950, electric guitars only. From 1944 to the end of 1950, specific 2-digit prefixes were assigned to individual electric models. The ending 3 digits indicated the actual production number. Unfortuneatly, there is no data available for exact production numbers/years at this time. This impressed serial number may be found on the back top of the peghead. 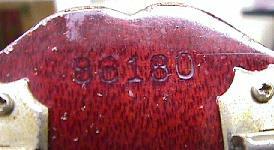 Serial number on a 1956 Epiphone acoustic guitar. Serial Numbers, 1951 to 1956, acoustic and electric guitars. 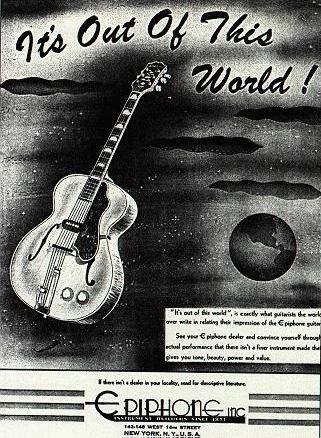 The last known New York-made Epiphone was serial number 69637 (Epi Zephyr). Gibson-made Serial Number, 1958-1960, solidbody guitars. Number is ink stamped on the back of the peghead. As with Gibson solidbody guitars of the same period, the first digit of the serial number is the last digit of the year. Gibson-made hollowbody serial number as used from 1958 to 1961. Gibson-made Serial Numbers, 1958 to 1961, hollowbody guitars ("A" series). Hollowbody models: number is on the label, with "A" preceding the number. The Epiphone number series is different than the A-series used on Gibson brand instruments of the same period. Serial number as used from 1961 to 1969. This is a 1962 Epiphone Coronet. Gibson-made Serial Number, 1961 to 1969, all instruments (non "A" series). Beginning in 1961, Epiphone serial numbers follow Gibson's serial number series. All models, stamped in back top of peghead. No "MADE IN USA" stamp below serial number! Note many serial numbers are duplicated from 1963-1969. To figure out which is the exact year for a guitar, see the General Specs section for details. Numbers thanks to Walter Carter. Copyright 1995-2002 all rights reserved.